Over the Thanksgiving weekend, girls from all units in Burnaby Mountain District participated in a cookie blitz at several local locations. 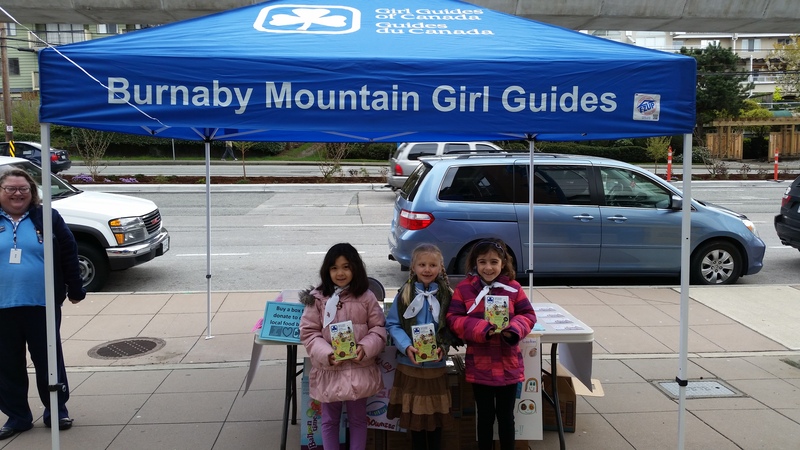 Girls sold chocolately mint Girl Guide Cookies at Save on Foods, Dollar Tree, Independent Grocers, Nestor’s Market SFU, Production Way Skytrain and Lougheed Skytrain. Some of the girls are very goal-oriented. Girls from the 22nd Guides, for example, were not shy about advertising that their cookie sales are going towards a trip to Victoria in the new year. There are also girls in the district selling cookies to help them fundraise for SOAR 2017, a week long provincial camp this summer in Smithers, BC. Other great Guiding activities supported by cookie sales in Burnaby Mountain District will include sleepovers and camps, including a district sleepover at the BC Sports Hall of Fame this spring! Thank you to all the local businesses who supported Guiding by allowing us to sell in front of your locations, and thank you as well to all the hard working volunteers who took time time out of their busy long weekend to sell cookies with the girls. Although “peak” cookie season has passed by now, some Burnaby Mountain units are still selling cookies. 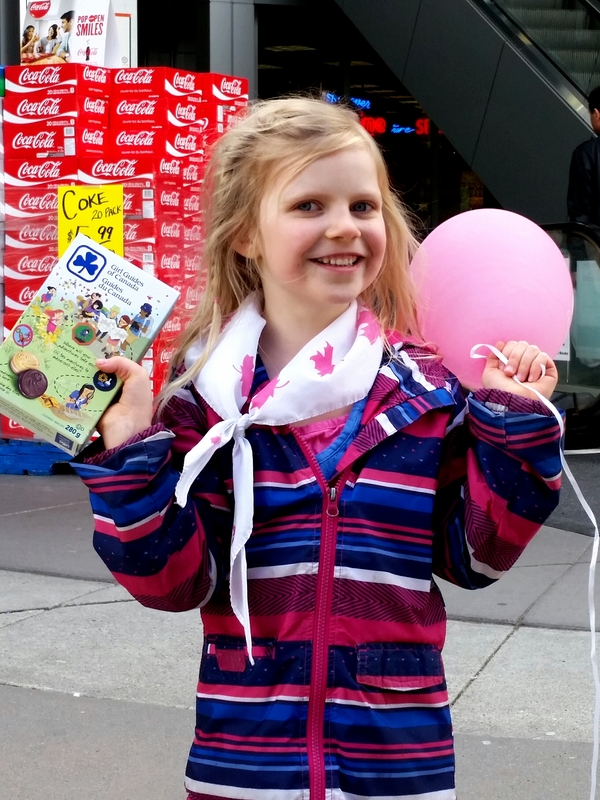 Just last night the 24th Brownies had a successful blitz at Lougheed Skytrain Station. Way to go, girls! The 14th Pathfinders have shared a couple of photos of their recent Spring cookie sale efforts. One girl tenaciously took on Burrard Skytrain Station and did a great job. Also pictured are three girls at the District Cookie Day back in April. We love the handmade posters and the special brand of Pathfinder energy employed in these cookie sales! The Pathfinders tend to stay more active through the summer than our other groups. Although they pause their regular meetings for the summer months, the group still gets together at least a couple of times events such as camp or day trips like hikes. 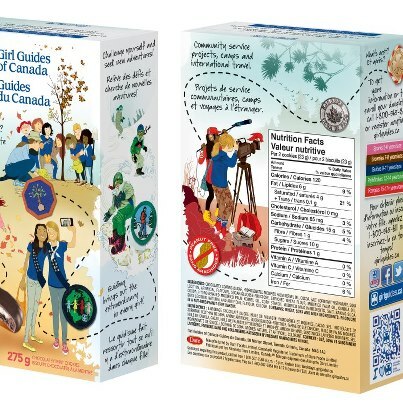 Girl Guide Cookies help power these adventures all year long. Back in December, girls and their families from Burnaby Mountain District gathered together for a day that put the “fun” into fundraising: a district bowling fundraiser! The district rented Old Orchard Lanes on Kingsway and families signed up for a game of bowling. There was also pizza and snacks available for purchase, plus a silent auction with lots of cool stuff. Everybody had a really great time. It was so fun to see so many people come together to engage in fun, physical activity for a great cause. What was the cause, you ask? The district was raising funds for its district camp in June. Specifically, we’re aiming to be able to have the funds for district to cover the cost of buses that will take girls all the way to camp from Stoney Creek School and back again — no driving out to Horseshoe Bay! Way to go, girls and families! Thank you to the leaders who helped to plan and run the event. And a HUGE thank you to the staff at Old Orchard who went above and beyond in helping us run a successful fundraiser. They were such a pleasure to work with and we highly recommend their bowling lanes as a great place to have some fun. The Spring cookie campaign is well under way in Burnaby Mountain. Many units have already sold all their cookies, and even District is running low on its supply! 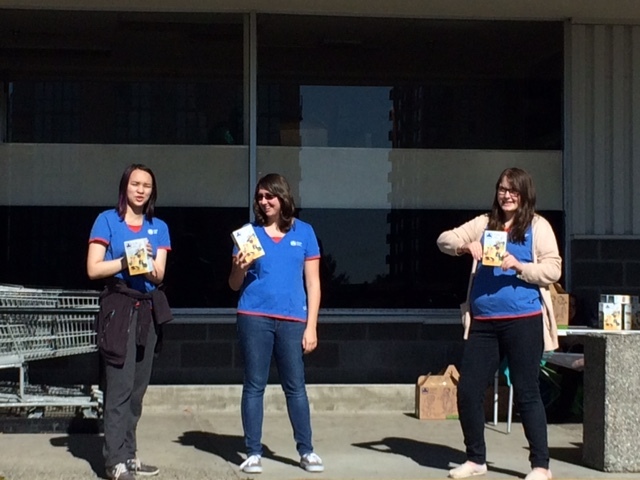 Yesterday girls from most units in the district came out to sell cookie in a true blitz style throughout the district. It would have been hard to be out in public yesterday in Burnaby Mountain District and not have come across our girls. Units were selling from 10:00-4:00 at Save-On-Foods North Road, Wal-Mart Lougheed Mall, Independent Foods North Road, Sears Outlet on Lougheed, Dollar Tree at Cameron, and Nestor’s Market at SFU. Cookies sold really well across the campaign and it was great to have our girls out and about being seen. The weather mostly cooperated though it was chilly and blustery for part of the day. Thank you to all the girls who came to sell, to the leaders who organized and supervised them, and to the local businesses who supported Girl Guides by letting us sell outside your stores. Girl Guide Cookies for Sale! It’s Chocolatey Mint Girl Guide Cookie season already! Girls have had their cookies for about a week so you may have had family, friends, and neighbors try to sell to you already… Please do try to contribute to this great cause! 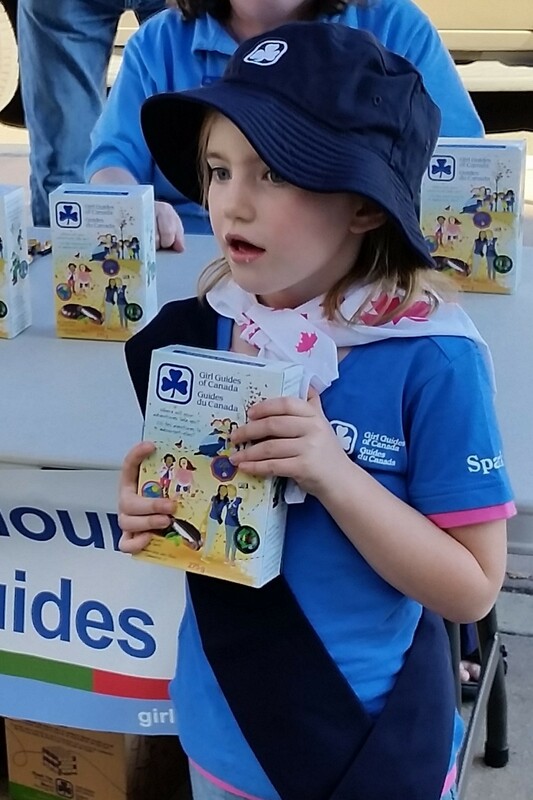 Cookies are Girl Guides of Canada’s official fundraiser and provide a major portion of our operating budget. 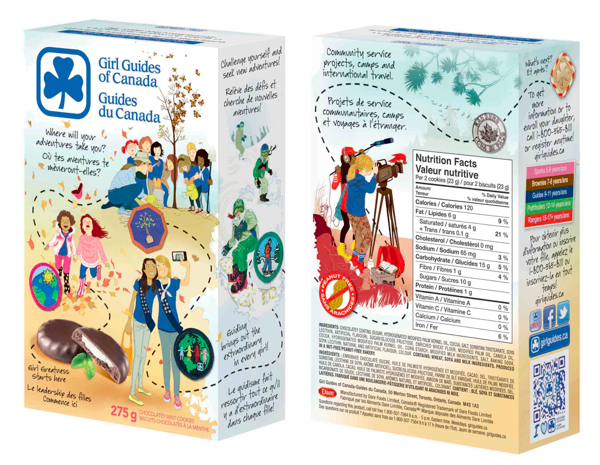 By buying Girl Guide Cookies you are helping to support girl programming including crafts, outings, camps, travel, training, and more. This week, more than 2500 boxes of chocolatey mint cookies arrived for our District to sell. Cookies have been distributed to units, who have given them to girls this week. This year, the cookies are coming out in awesome new packaging. The new look really highlights what Girl Guides is all about. What else is new about cookies this year? Well, although it has been true of our cookies for a few years now, we are now have the nut-free symbol right on the box. Also, trans fats in the chocolatey mint cookies have gone down by 90%.